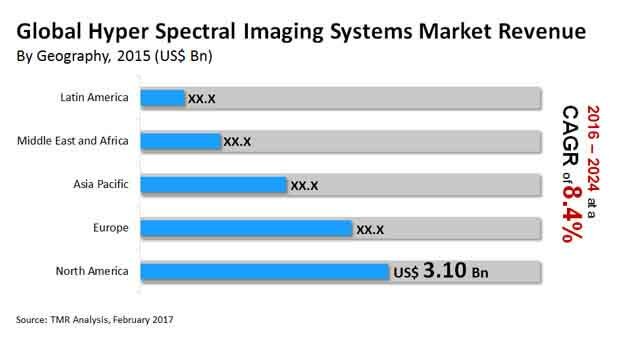 The global hyper spectral imaging market is majorly dominated by a handful of players, which makes the market fairly oligopolistic in nature. The top three players including Thermo Fisher Scientific, FLIR Systems Inc., and Teledyne Technologies account for a little below 65% of the total market share, thus, making the market highly consolidated. Despite this consolidated nature of the market, the competition in the market is intense. The moves of one market players are expected to invite a reaction from the other players in the market. The leading players are found to focus on expanding their geographical reach through mergers and acquisitions. This would grant them access to the regional and local market, thus, fetching a wider consumer base for them. Furthermore, these players are also expected to expand their product portfolio and offer novelty products to the customers. Production innovation is anticipated to helm the progress of the market players. Hence, each of the leading market players are aiming to get a competitive edge over others through better and more functional products. Transparency Market Research (TMR) projects the growth path of the market from 2016 to 2024 in order to ascertain key trends, opportunities, and restraints that lie ahead of players. The market is expected to inflate at a respectable CAGR of 8.40% over the period from 2016 to 2024. Furthermore, the market was valued at US$9.12 bn in 2015 and is expected to uptick to a value of US$18.88 bn by the end of 2024. Segmenting the market based on end-use, the military surveillance and homeland security segment was valued at US$1.86 in the year 2015, outdoing all other categories. Despite the affluence of this segment, the food processing industry is expected to register the highest CAGR over the forecast period. Geographically, North America grossed in the highest market share of 34% in the global market. Hyper spectral imaging system (HIS) uses an electromagnetic system to collect and process data. There is abundant data processed by these systems, which makes it easy to identify objects. The composition of medicine, for example, can be easily analyzed with the use of these systems. A number of fatal diseases can also be diagnosed with the help of these systems. This spurs the popularity of these systems in the medical and healthcare industries. Furthermore, these systems can also help in finding oral medical complexities without the use of drilling machines, thus, making oral treatments non-invasive to an extent. The deployment of these systems for surveillance and remote testing is also a prudent driver of market growth. The food packaging industry has also become an ardent consumer of these system for the testing and analysis of the quality of food. Agricultural applicability is another key usage that proliferates the demand for these systems. These systems help in monitoring the nourishment of crops and can act as a warning signal if there is a plague. It is anticipated that, as these systems become technologically advanced, a wide array of industries would adopt these systems for multiple uses. The high costs associated with the purchase, procurement, and installation of these systems could hinder market growth. However, advanced technologies could lead up to a reduction in price of these systems. This would bolster the adoption rate of these systems across several industries. Moreover, the demand from astronomy, mineralogy, and other aligned fields is also projected to offer lucrative growth opportunities. Healthcare Industry becomes a prolific consumer of hyper spectral imaging systems. Growth of these systems across multiple industries expected to keep bolstering market growth.